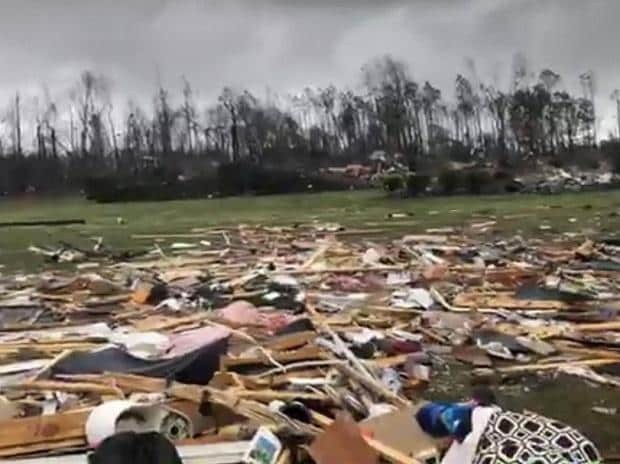 An apparent tornado roared into southeast Alabama and killed at least 22 people and injured several others Sunday, part of a severe storm system that destroyed homes, snapped trees and unleashed other tornadoes around the Southeast. Dozens of emergency responders rushed to join search and rescue efforts in hard-hit Lee County, Alabama, after what forecasters said they think was a large tornado touched down Sunday afternoon, unleashed by a powerful storm system that raked its way across parts of Georgia, South Carolina and Florida. "I can confirm 22 fatalities," Lee County Sheriff Jay Jones told The Associated Press on the scene in Beauregard, the area of apparently greatest destruction. He told reporters that children were among the dead and that some people are still believed missing and that a search and rescue operation was continuing. "Unfortunately we believe that number is going to go up," Jones said of the fatalities. He said the apparent twister travelled straight down a key local artery, Highway 51, and that the path of damage and destruction appeared at least a half mile wide. Radar and video evidence showed what looked like a large tornado crossing the area near Beauregard shortly after 2 p.m. Sunday, said meteorologist Meredith Wyatt with the Birmingham, Alabama, office of the National Weather Service. Beauregard is a community about 60 miles (95 kilometers) east of Montgomery, Alabama's capital city. "It appears it stayed on the ground for at least a mile and maybe longer," Jones told AP. He said single-family homes and mobile homes were among the buildings destroyed. He had told reporters earlier that several people in the county were taken to hospitals, some with "very serious injuries." After nightfall Sunday, the rain had stopped and pieces of metal debris and tree branches littered roadways in Beauregard. Two sheriff's vehicles blocked reporters and others from reaching the worst-hit area. Power appeared out to be out in many places. Rita Smith, spokeswoman for the Lee County Emergency Management Agency, said about 150 first responders had jumped in to efforts to search the debirs after the storm struck in Beauregard, about 60 miles (95 kilometers) east of Montgomery. At least one trained canine could be seen with search crews as numerous ambulances and emergency vehicles, lights flashing, converged on the area. Authorities said a tornado was confirmed by radar in the Florida Panhandle late Sunday afternoon. A portion of Interstate 10 on the Florida Panhandle was blocked in one direction for a time in Walton County in the aftermath, said Don Harrigan, a meteorologist for the National Weather Service in Tallahassee.